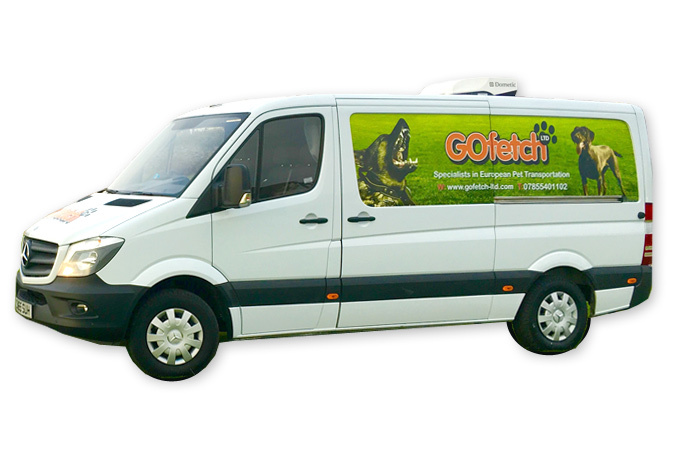 "We transport your dog or cat safely to your desired destination"
At Go Fetch Ltd, our main method of pet transportation is via road, using a high specification, purpose built van. When travelling out of the UK, the port we leave from will vary depending on the final destination. However, our preferred option is the Eurotunnel, as this is not only the most time and cost effective option, but it isn’t weather dependent. Catering for private and commercial customers alike, regardless of whether we're looking at powerful Newfoundlands or petite Chihuahuas, we always plan for your pet to have a first class service from the time they're collected to the delivery location. What's more, where necessary (such as if your flights mean your pet will need to leave after you), we have an excellent relationship with a local, fully licensed boarding kennels. Alternatively, they can be collected from a location of your choice. Fully committed to providing an industry-leading service, one where the animals' welfare comes first at all times, our transport service means you don't have the hassle of arranging your pet to stay in airport holiday kennels or the stress associated with being flown to their destination in a general, standard manner. Instead, your pet will be given a service where all of its own individual needs are completely catered for. This includes ensuring dogs are frequently exercised on route to their final destination and all animals have a constant, fresh supply of water, with feeding happening at times the animal is used to. Furthermore, any pets that require medication are fully catered for, with medication administered at no extra cost. All we require is clear, written instructions of what needs to be given and when. Experienced handlers of all types of animals, we believe anything is possible when it comes to transporting pets at Go Fetch Ltd. Striving to continue leading the way for pet transport, we maintain extremely high standards of vehicle maintenance and cleanliness and ensure all kennels are cleaned and disinfected thoroughly after every pet is removed, something that Sapphire Valet Services carry out for us. What's more, we're always 100% transparent with everything we do and are always more than happy to share our knowledge and experience.